Monstrosity is famous for housing members that went on to more famous regional outfits, Cannibal Corpse and Malevolent Creation most prominently among them. Missing the momentum of its more marketable regional peers and not as prolific in its output Monstrosity has established itself as a reliable act by delivering a handful of albums full of high-precision death metal that is both technical and pummeling in equal measure. “Imperial Doom”, the band’s only record for Nuclear Blast Records, is its least distinct being very redolent of Malevolent Creation. 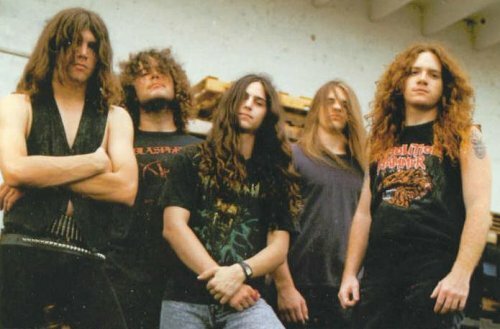 The band was formed in Fort Lauderdale, Florida by former Malevolent Creation members Lee Harrison (drums) and Jon Rubin (guitars) with vocalist George Fisher, who had left his old band Corpsegrinder and moved from Maryland to Florida, in 1990. Mark van Erp (bass guitar) quit his other band Cynic to fully commit to Monstrosity. Jason Gobel, also of Cynic, functioned as a session musician for the “Imperial Doom” recording sessions, but never was a formal Monstrosity member. “Imperial Doom” became retroactively famous for having an all-star Tampa, Florida line-up consisting of current/future members of illustrious institutions Malevolent Creation, Cynic, Solstice and Cannibal Corpse. 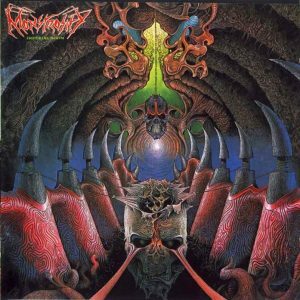 ‘Definitive Inquisition’, ‘Immense Malignancy’, ‘Horror Infinity’, and ‘The Burden Of Evil’ were re-recorded tracks from the 1990 “Horror Infinity” demo tape. Notable is that Lee Harrison’s work behind the drums is more straightforward compared to later Monstrosity albums, although he is far more proficient in terms of fills and flexibility than many more visible drummers of the day. ‘Ceremonial Void’ has some of best soloing of the record, and the song gives Cannibal Corpse a run for its money. The lion’s share of the record was written by Lee Harrison and Jon Rubin. Mark van Erp co-wrote ‘Definitive Inquisition’ and ‘Burden Of Evil’ with Lee Harrison. Monstrosity was the first big opportunity for George Fisher after leaving Corpsegrinder in Maryland and relocating to genre hotbed Tampa, Florida. Frank Mullen of New York death metal contemporaries Suffocation donated vocals to ‘Vicious Mental Thirst’. Fisher returned the favor by guesting on two tracks from “Effigy Of the Forgotten”, the debut of Mullen’s own band on then-relevant label imprint Roadrunner Records. “Imperial Doom” was recorded at Morrisound Studio in Tampa, Florida with Jim Morris producing. The Morris production is typical of the era in its concrete bass-heaviness and crunchy, earthy tones. The production has a grittiness that later Monstrosity production lacked, and the imposing bass guitar tone is especially commanding. The grotesque horror canvas by Dan Seagrave is among his best – and Monstrosity would struggle on future product to match the iconic imagery by Seagrave presented here. Jason Gobel was replaced by Mark English for the European tour in support of the album. Gobel would later feature on Cynic’s legendary debut “Focus”. English would eventually make his return with Monstrosity at a much later stage. Fisher would figure into the second Monstrosity album “Millennium” before being installed as the new frontman of Tampa-by-way-of-Buffalo outfit Cannibal Corpse. Through out all its different reconfigurations Lee Harrison (drums) would remain a constant. Easily eclipsing many of its regional peers Monstrosity never received the accolades they deserved. For the majority of its career Monstrosity was troubled by personnel changes, and falling out of favor with the popular tastes of the day. While not exactly inferior to any of its future output “Imperial Doom” is the most stock Tampa sounding in both composition and production. Monstrosity would not develop its characteristic sound until after “Imperial Doom”, which served merely as a blueprint. Allegedly “Imperial Doom” sold excess of 50,000 copies worldwide. Monstrosity was bound for superstardom but disagreements with its label and personnel trouble would relegate it to a second-tier status despite its obviously immense technical expertise.